Laboratorio de Analisis Ambiental, Escuela de Ciencias Ambientales, Universidad Nacional. Campus Omar Dengo, Heredia, Costa Rica. Concentrations of inorganic ions (Cl-, H+, SO42-, NO3-, NH4+, Na+, K+, Ca2+, Mg2+) and metals (V, Ni, Cu, Pb, Cr Mn, Al, Fe) in bulk precipitation and PM10 samples collected in the metropolitan area of Costa Rica were analyzed. 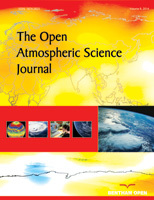 Good correlations between acidity in bulk precipitation with the concentrations of aerosols in the air were observed. The scavenging of the pollutants from the air directly affects the pH and composition of the bulk precipitation. The major ions in bulk precipitation in the metropolitan area of Costa Rica were SO42-, NH4+, Ca2+, Na+ ion percentages with 41.4, 12.0, 10.9 and 9.1 respectively. Al, Fe and Mn were the most abundant trace metals. The alkaline cations, NH4+ and Ca2+, actedas acid neutralizers and buffered the acidity of bulk precipitation. Meteorological conditions presented during the events determine the composition of bulk precipitation samples.